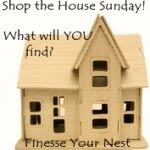 Today I'm participating in the very first Shop Your House Sunday with our lovely hostess, Kendall at Finesse Your Nest. The premise behind this new meme is to "Shop" your house (in your pajamas if you wanna!) and create something for free! Projects can be ANYTHING, like repurposing an item, moving something to a different room for a new look, a recycled project, painting projects, organizing projects, tablescapes, rearranging furniture...the sky's the limit. 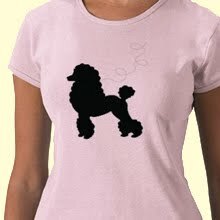 I can't tell you how perfect this is for me! I have so many projects that have been put on the back burner, especially since I started blogging. When Kendall first announced she was going to hold this weekly event, I left a comment that said something to the effect that it would force me to get some of these things done. AND, this week I did just that. Well, I hate to admit this, but after Christmas I moved it out of the way and this morning it was still sitting there on a little table in the dining room. We have a lot going on around here (you'll find out more later this week) and I've been meaning to take it apart, remove all the Christmas goodies and make it into a simple shell display. 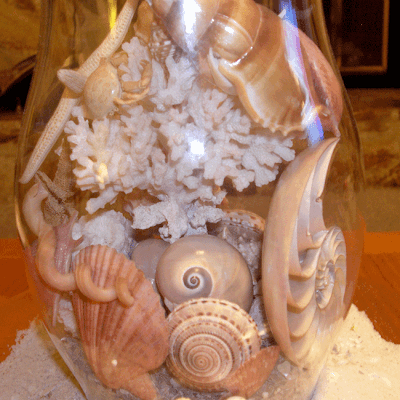 We have a LOT of shells around The Hut and putting them in vases and jars is one of my favorite ways to enjoy part of my collection. I finally started and finished this project this morning with my morning coffee. Thanks Kendall for helping me get this particular project completed and yes, I did it in my pajamas! This is the completed look and I must say, I'm very pleased with the way it turned out. The next time you're at the beach and your hubby is asking you what your going to do with all those shells when you get them home — think about something like this. 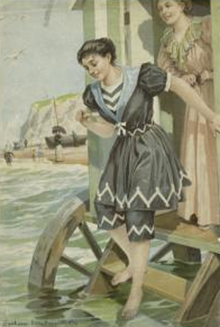 It's a lovely reminder of days spent on the beach, especially during the winter. I often see people do something like this, but they usually just dump the shells in a vase. When I start mine, I fill the bottom with either sand or crushed shells. Then I line the bottom sides with a few of my favorites. Next I put something larger in the middle to act as a holder of sorts. In this one I used a piece of coral. This way I can "perch" other goodies on it so that I end up with interesting nooks and crannies. 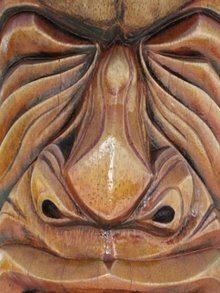 You'll find visitors will peer inside to see what is partially hidden from their view. See what I mean? Your eyes are drawn to those little crannies and it is much more interesting than just dumping in the shells. In this photo you can see the tips of a couple of other shells that would have been lost had I used the dumping method. 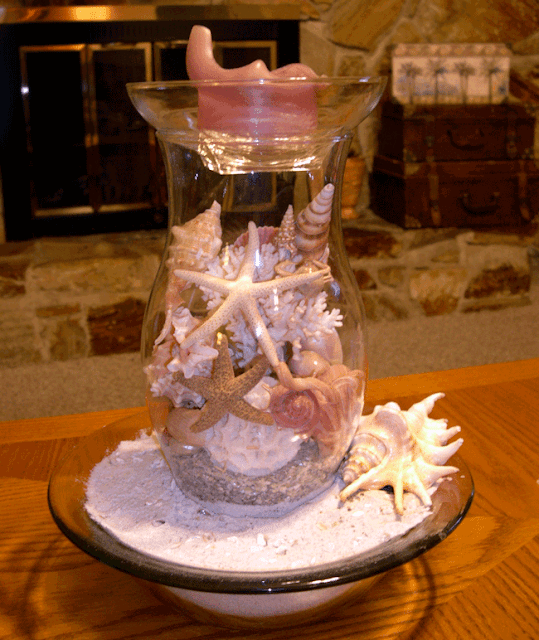 The pieces you add will end up wedging themselves between the coral and the glass and actually be very stable. I like to top the glass with a something like a shallow bowl to hold a candle. This serves two purposes — I have a unique candle holder and it keeps out the dust and pet hair, very important here at The Hut. You can also top it with just a glass circle cut at your local glass shop. But, be sure to top it with something, these are a pain to keep clean otherwise. So, that's my project this week, very easy I know, but finally all traces of Christmas have disappeared from The Hut and I can move on to something else. I hope you all enjoyed this project and that it will give you the incentive to do some of yours. When you do be sure to link up with Shop Your House Sunday, I'd love to see the results. Stop by Kendall's by clicking on the button in this post or in my sidebar to see who else participated this week. 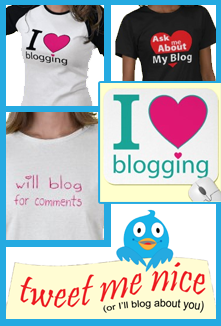 I just had a quick look around your blog and it's lovely! 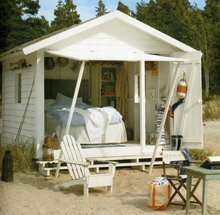 I love the beach and so wish I lived near one again--I had five years of bliss living near them...now I'm land locked. I'm in utter amazement that you collected all those shells! I never find anything so impressive but that doesn't stop me from trying! I've such chaos and clutter..
and re purpose my office..
all my editing /printing supplies..
add MY coffee cup/iced tea glass! The idea of looking beyond the expected...is pulling at my heart strings! Will you use it again next year? Will you add to it? That is simply beautiful! What a lovely reminder of summertime as I shiver from the horrid winter winds on P.E.I.!!! :) Great idea Jolly Holly Shell Belle!!! Love this "tree"! It's quite unusual...so like you. 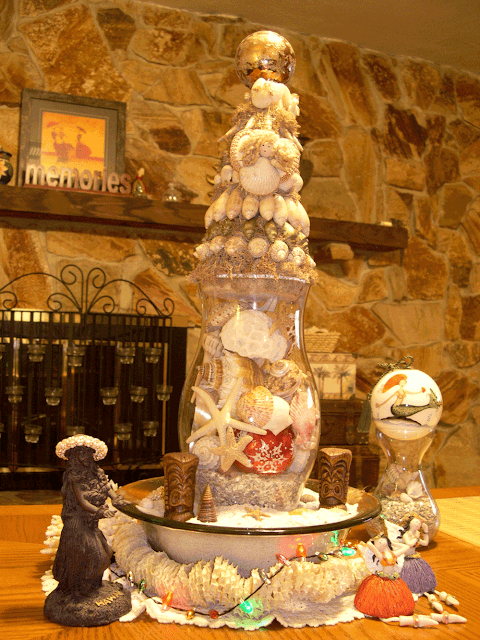 I'm already thinking about next Christmas's decor...more shells...more FL. stuff. Should keep me busy all year. Have a wonderfully relaxing Sunday. 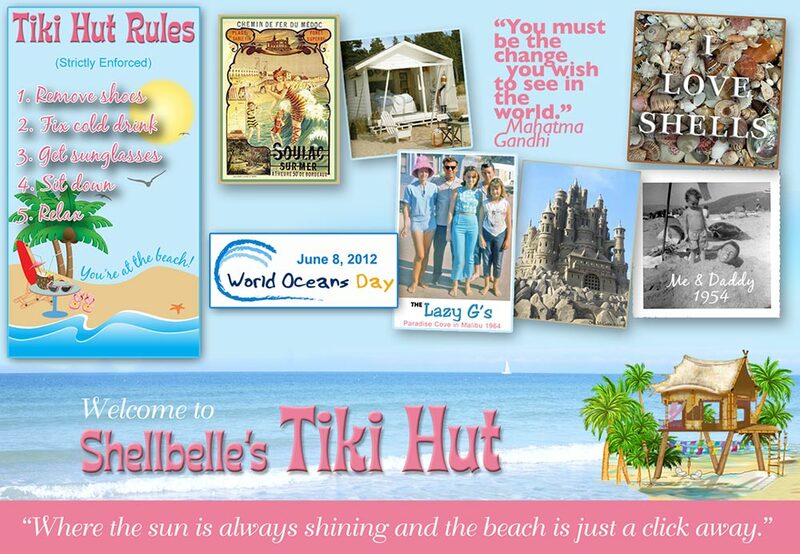 Love your beachy blog! So wish I were near a sunny beach right now; I'm so tired of the cold! Gorgeous Shellbelle!! Its like a composition, you made it all flow and work together perfectly. I especially love the soft neutral shades that just play off each other with the iridescent shimmer. A really nice project for a Sunday afternoon. We are celebrating loved ones birthdays this weekend...cooking and eating a lot. I have been organizing and recycling old magazines etc. As far as projects I have been filling heart sachets with lavender from the herb farm up the road...very peaceful and simple on this lovely Sunday. Thanks for sharing such a pretty project from your Hut. Wow...what an awesome collection of shells...luv that tree! I love this idea!! I wish I knew where all my shells were..who knows. My best friend has a beach house so I think I will ask her to start collecting some for me. Thanks for the idea!! I love this Rhonda. 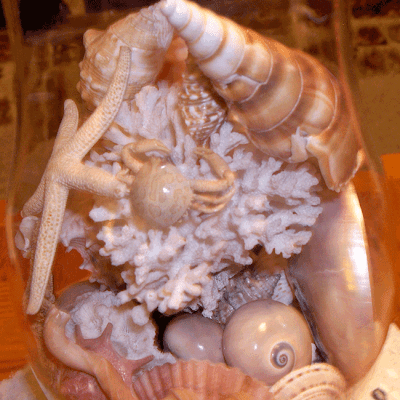 I love seashells and sea glass and I'm always goingbeach combing to add to my collection. I have to admit I've "dumped" my sells into a glass vase in the past..I am going to re-think that after seeing your beautiful arrangement. Well you know I love this. I have shells all over my house! It turned out beautiful! 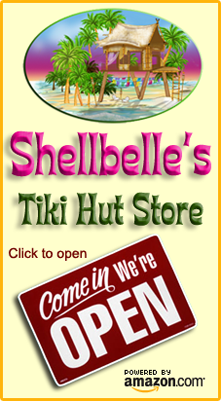 You have some gorgeous shells to work with! The husband comment made me laugh! My husband does the same thing. I once tried to talk him into renting a UHaul to get a big 9ft long piece of driftwood off the beach. He thought I was crazy. We just bought an extended length Expedition, so the next time we're at the beach, "it's on!" Thanks for linking up to my 1st Shop the House Sunday. See you next weekend for more "pajama crafts"!